The Eucharist is Christ's gift to his followers to sustain them as they journey to their eternal home. It is the source and summit of the Church's life and mission. As a sacrament, it is a visible sign of Christ's abiding presence -- body, blood, soul and divinity -- in our midst under the appearance of bread and wine. What does this mean? How can Christians of the East and West receive the Lord worthily? What must we bring to the altar? 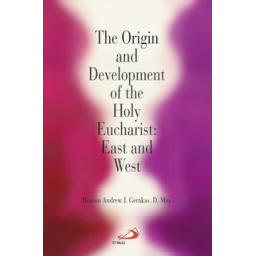 The biblical background and history of the Eucharist in the Orthodox and Roman Catholic Churches, and a comparison of current practices, will be found here along with chapters on our joint Jewish and Greek heritage. Also reviewed are some of the doctrinal and organizational differences that continue to inhibit a return to intercommunion, the ultimate goal of both Churches in their desire to fulfill the Lord's prayer "that all may be one." Members of both communions will find much here to contemplate and consider. Author Gerakas Deacon Andrew J.